Th Gaurs will look to extend their lead at the top of the tabl as Pune seek to get back to winning ways. FC Goa will be looking to keep the top spot with a win when they take on FC Pune City in the Indian Super League (ISL) match at Jawaharlal Nehru Stadium, Fatorda, Goa on Saturday. The FC Goa coach Sergio Lobera had a big task to reform the Goan side which finished at the bottom of the table in the last season. But, the Spaniard made it easy and brought the Gaurs back to the top with some impressive football, where they have won four matches out of the five played. 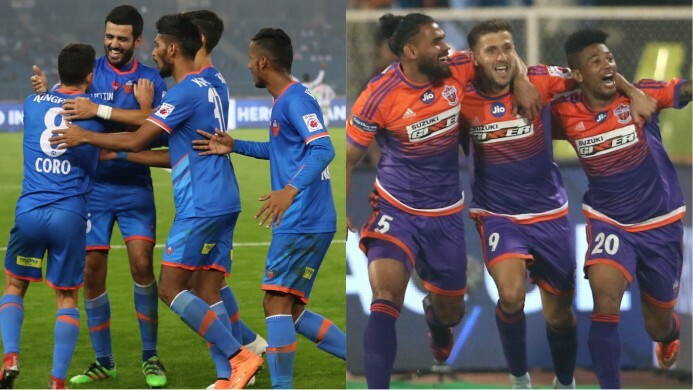 The Spaniard has stressed more on attacking football and his compatriots, Ferran Corominas, Manuel Lanzarote and Eduardo Bedia along with the Indian duo of Brandon Fernandes and Mandar Rao Desai in the attack have made it easy for the Gaurs to come out victorious against any opponents. Whereas the Stallions have become one of the most unpredictable sides in the ISL this season but coach Ranko Popovic holds on to his squad rotation policy. However, his team does have a hardworking defence and a really balanced squad in general. Even after such a roller coaster ride, the Stallions still sit in fifth place behind Mumbai. This team is Louis van Gaal’s Manchester United in reverse. Their away form has been brilliant and has cancelled out the disappointing home run. They have three losses at home but have won all their away games. Coincidentally, all their away wins have come after their home losses. FC Goa head coach Lobera has not made a single change to his side in the last four matches and the Spaniard is most likely to go with the same winning combination. Another good news for the Goans will be the return to fitness of another Spanish striker Adrian Colunga who appeared in the second session of the last match against Delhi Dynamos. The forward also made sure that his appearance was marked with a clinical goal in the dying minutes. On the other hand, Popovic has been rotating his squad from the start and most will continue with the same strategy when they take on high-flying Goans. Lalchhuanmawia, who was sent off in the match against Jamshedpur FC will be available for selection, while Baljit Sahni will miss the match due to the straight red card in the last match against Bengaluru. Brazilian forward Marcelinho might make a comeback after missing out ON the last match due to fatigue issues. Both the teams have a balanceD past record as both have shared two wins each, with two other games ending in draws. They also share an equal number of goals from the total 14 goals scored between the two sides. Ferran Corominas-FC Goa: Corominas has been a smart signing by the Goan side as his hunger for goals has increased in every match. A goal and assist in the last match against Delhi made him the leading scorer of the season and also the joint leader in the assists with Lanzarote. The frontman is clinical in front of goal and can create his own chances in difficult situations. If Pune are expecting at least a point from this match, the Spaniard will be the man to stop for the Stallions’ last line. Adil Khan-FC Pune City: Adil took over Rohit Kumar’s position after the latter was left out of the squad due to illness. Two goals in consecutive games and brilliant displays in the midfield have seen him cement his position in the team. Given the form that he’s in and given the opponents that they are playing, Adil might just pair up with Rohit and form a Kante-Bakayoko type defensive midfield against the likes of Coro-Brandon-Mandar-Lanzarote. FC Goa: Kattimani, Das, Ali, Pinheiro, Seriton, Bedia, Rao Desai, Jahouh, Lanzarote, Corominas, Brandon. FC Pune City: Kamaljit, Fanai, Gomez, Gurtej, Isaac, Kumar, Lucca, Lewis, Carlos, Alfaro, Marcelinho. Goa’s coach Lobera has created a record when he became the first coach in ISL history to name the same starting XI in four straight matches. The Gaurs have scored 18 goals in just five matches, four more than second placed Bangaluru FC who have played seven matches. Pune has conceded the red cards in last two back-to-back matches. The match will be broadcast live on Star Sports 2 and Stars Sports 2 HD 5.15 pm onwards. It will be also available for live streaming on Hotstar and Jio TV.